Why Should I Call or Click before I Dig? There is an underground network of gas lines, electricity, telephone, internet and TV cable wires, as well as water and sewer connections that could be damaged if you dig in the wrong spot. Knowing what’s below protects you and your family. Expensive restoration costs and potential legal action against you. For your safety, and the safety of others, you must determine where the underground facilities are located BEFORE starting construction, landscaping or any other project. Then, when the underground facilities have been marked, you can dig with care. 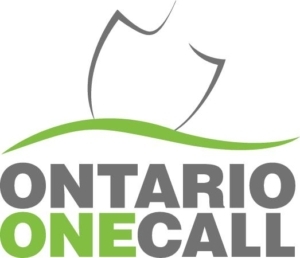 Contact Ontario One Call at least one week before starting your project to ensure locates are completed on time. This is a FREE service and available 24 hours a day, 7 days a week. Not all facility owners are members of a one call centre. Make sure to contact non-participating facility owners that may apply to your excavation such as Government Agencies, Railways or First Nations.